If you are a gardening enthusiast, you should know how useful is to have a strong, practical and compact rack with you. 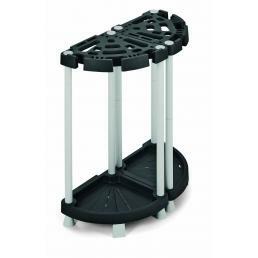 In the Mister Worker™ catalog you can find the Terry rack in high quality plastic. The Terry rack, made of high-quality resistant plastic, is specially designed to be kept outdoors. It resists perfectly the wind, is very stable and roomy, and does not ruin with rain: it is perfect for storing rakes, spades, shovels and all garden tools. If you want to be even more sure of its stability, you can put on the bottom of the weights, such as sand or gravel bags: in this way it will remain motionless even in the days of strong wind. The material with which it is produced is light but resistant: it can be easily drilled to fix it to the wall, in case you prefer to put it in a tool shed. Even if you decide to fix it, the important thing is always to arrange the weights in a wise and homogeneous way, or it could be damaged and ruined over time. When you are a gardening enthusiast, a rack like this from Terry is an excellent solution to keep your tools tidy, without taking up too much space. If you want some advice on how to use it better or want to know more, call us at +39 02 9143 3257 or write us an email to [email protected]: our team of experts is here to help you and advise you the best!